Protologue: Ber. Deutsch. Bot. Ges. 15: 24 (1897). Alangium begoniifolium (Roxb.) Baill. (1876). Alangium chinense occurs from Cameroon east to Ethiopia, Kenya and Tanzania, and south to Zimbabwe and Mozambique. It is also widely distributed in tropical Asia from India to China, Japan, Thailand, the Philippines and Indonesia. In Africa the wood is used for carvings and scabbards of swords and knifes. It is also used in arm ornaments. Alangium wood is used in Asia in building as beams, for flooring, furniture, cabinet work, inlaying, carving, bobbins, spindles, shuttles, rice pestles, tool handles, walking sticks, gunstocks and handicraft articles. Roots, bark and leafy twigs are used in traditional medicine in Africa. Root powder is used to treat headache. Root and leaf decoctions are used to treat stomach pain, and as a purgative. A decoction of leafy twigs is drunk to treat mental illness. In DR Congo bark macerations are used for the treatment of skin diseases and elephantiasis. Alangium chinense is planted in life fences and along farm borders. Flowers produce nectar collected by honey bees. In DR Congo caterpillars feeding on the leaves are collected to serve as food after roasting or boiling. The heartwood varies in colour from white to grey and shades of brown; it is not distinctly demarcated from the sapwood. The grain is straight. The wood is soft and specific gravity (0% moisture content) is about 0.49. The density of Alangium wood from Asia varies widely from 440–1100 kg/m³ at 15% moisture content; it air dries well without checking, works well, bends easily and takes a good finish. The wood is not durable and should not be used for exterior purposes, especially when in contact with the ground. The alkaloid anabasin isolated from the root of Alangium chinense exerted a significant neuromuscular blocking effect on isolated rat phrenic nerve-diaphragm preparations and also showed a depolarizing effect on isolated frog sartorius muscles. Small to medium-sized tree up to 24 m tall; bole with diameter at breast height of about 30 cm; bark surface smooth and grey; twigs purple-brown, glabrous but pubescent when young. Leaves alternate, simple, without stipules; petiole 0.5–2.5 cm long; blade narrowly elliptical to broadly ovate, 4–19 cm × 2.5–10 cm, base cuneate to rounded, truncate or cordate, asymmetric, acuminate at the apex, entire in mature plants,5–7-veined from the base, veins connected by many small parallel veins at a right angle to the main veins. Inflorescence an axillary cyme, 1–4-branched, less than half the length of subtending leaves, glabrous or pubescent, 3–23-flowered; peduncle up to 2 cm long and branches up to 2.5 cm long. 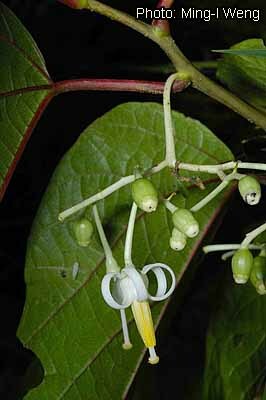 Flowers bisexual, regular, 5–8-merous, white, cream or yellow, sweet-scented; buds flask-shaped to cylindrical and usually swollen at the base; pedicel 3–5.5 mm long; calyx-tube cylindrical or funnel-shaped, c. 1.5 mm long, with 5 teeth c. 1 mm long; petals strap- or tongue-shaped, 8–13.5 mm × 1–1.5 mm, pubescent outside, glabrescent inside apart from an area approximately one-fourth of the way up from base; stamens the same number as petals, 5–9 mm long, pubescent at the base, anthers narrowly linear; ovary inferior, 1–2-celled, style cylindrical, 7–10 mm long, pubescent, stigma slightly lobed. Fruit a laterally compressed, globose or ellipsoid drupe, 8–10 mm × 4–9 mm, basally rounded, apically tapering, ribbed when dry, finely pubescent, 1–2-seeded. Leaves of seedlings and coppicing shoots are usually palmately lobed and larger than leaves of adult plants, up to 25 cm × 25 cm. Alangium comprises about 25 species, most of them occurring in South-East Asia. In tropical Africa 2 species are indigenous, both of which are widespread outside Africa. Alangium chinense is a fast growing pioneer species mainly found in disturbed lowland and montane forest up to 2000 m altitude in Africa and up to 3000 m in the Himalayas. Alangium chinense can be propagated by seed and is reported to have a fairly good natural regeneration. Alangium chinense is widespread and occurs in a variety of habitats. Hence it is unlikely to be under threat of genetic erosion in Africa. However, several Alangium species from Asia have been classified as vulnerable in the 2008 IUCN list of threatened species. Alangium chinense is fast growing and occurs in a wide variety of habitats. Its potential in agroforestry systems has been investigated in Kenya, and it was rated as a high priority species for planting in taungya systems. The wood of Alangium is used in Asia for house construction, furniture and other products. Hence further research on Alangium chinense is needed to explore it full potential in Africa. Cannon, J.F.M., 1978. Alangiaceae. In: Launert, E. (Editor). Flora Zambesiaca. Volume 4. Flora Zambesiaca Managing Committee, London, United Kingdom. pp. 633–634. Oduol, P.A. & Akunda, E.W., 1989. Tropical rainforest tree species with agroforestry potential. In: IFS (International Foundation for Science). Proceedings of a regional seminar on trees for development in sub-saharan Africa, February 20–25, 1989, Nairobi, Kenya. pp. 49–57. Phengklai, C., 1998. Alangium Lamk. In: Sosef, M.S.M., Hong, L.T. & Prawirohatmodjo, S. (Editors). Plant Resources of South-East Asia No 5(3). Timber trees: Lesser-known timbers. Backhuys Publishers, Leiden, Netherlands. pp. 55–58. Verdcourt, B., 1958. Alangiaceae. In: Turrill, W.B. & Milne-Redhead, E. (Editors). Flora of Tropical East Africa. Crown Agents for Oversea Governments and Administrations, London, United Kingdom. 4 pp. Chifundera, K., 2001. Contribution to the inventory of medicinal plants from the Bushi area, South Kivu Province, Democratic Republic of Congo. Fitoterapia 72: 351–368. Verdcourt, B., 1989. Alangiaceae. In: Hedberg, I. & Edwards, S. (Editors). Flora of Ethiopia. Volume 3. Pittosporaceae to Araliaceae. The National Herbarium, Addis Ababa University, Addis Ababa, Ethiopia and Department of Systematic Botany, Uppsala University, Uppsala, Sweden. pp. 535–536. Yang, Q.Z., Shu, H.D. & Lin, L.R., 1981. The blocking action of anabasine on the neuro muscular junction. Acta Pharmacologica Sinica 2(2): 84–88. Ebanyenle, E., 2009. Alangium chinense (Lour.) Harms. In: Lemmens, R.H.M.J., Louppe, D. & Oteng-Amoako, A.A. (Editors). PROTA (Plant Resources of Tropical Africa / Ressources végétales de l’Afrique tropicale), Wageningen, Netherlands. Accessed 12 April 2019. This page was last modified on 23 March 2017, at 18:41.